It’s always a great time of the year for me and MusTech.Net. As teachers get ready to start their year, I try to post more frequently and more of the things that teachers want and need in their information gathering endeavors. This year is NO different AND I’m going to attempt to add some new features! The Monday Morning Music Mix (MMMM) – This has been a long time feature of MusTech.Net and it will continue to bring you the best posts and information to you for your Monday mornings! PLEASE send me pictures of your morning beverages (coffee, tea, etc.). I will post them and give you credit as I get them and use them (seriously, send me some picts!). Use the contact form on MusTech.Net or Tweet me on Twitter (http://twitter.com/pisanojm). The Music Education Blog Carnival has already re-started and we are nearing the end of the submitting window for the Sept. Edition. Check out our posts about the blog carnival here and here. Wednesdays will now bring you updates about the latest and hottest conversations on the MusicPLN.org. Not a member yet? Sign up today – it’s FREE! Friday will become Resource Friday and I will be providing the latest links posted to our Music Education Diigo group and others of interest. 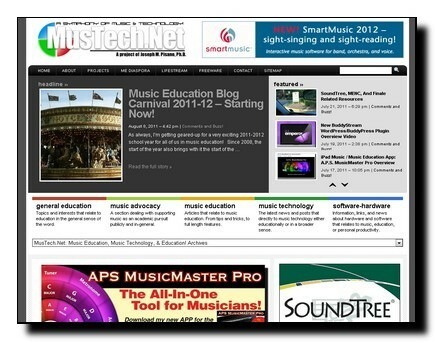 The Music Education Blogger Campaign will begin anew and this time there will be no end-date. More information about this coming next month. The Official Music Educator Twitter’s List will continue to be updated and I will be posting an Official Music Educator Google Plus List that consists of members of our Twitter Group and the MusicPLN.org. This one will be one to watch! Guest Posts – I’ve decided that I will be accepting at least one student guest article and one outside guest article per month to post on MusTech.Net. This is new and exciting as I rarely accept guests article writers here on MusTech.Net, but I’m ready to give this a try and think it might be a great asset and opportunity for a number of folks! More information about this will be posted toward the end of October. Finally, podcasts… oh…. podcasts. Last year I teamed up with Keith Mason at MusicTechForMe.com and we only did a few podcasts, but this year, I plan on something a little different, more exciting and more consistent… stay tuned! I hope you are all excited for a great year; I know I am! Our Grove City Marching Wolverines Band looks great this year and I’m sure my/our Jazz Ensembles will be just as awesome! We will be performing at Walt Disney World in October – the students are pretty jazzed-up about the trip! …and two, last, “shameless plugs” from me: If you aren’t a subscribing member of In-Tune Monthly, please check it out. I write for this magazine and it truly has incredible content that will relate to you and your program. Also, don’t forget to check out my new iPad application: A.P.S. MusicMaster Pro – it’s one program that you and your students need. You can find out more about it at the A.P.S. Development LLC website (want to really find out about it? check out the video or read the manual).